Early January saw some amazingly cold weather and some dreary days. The type of day that you don't want to wander around outside, but you've got to get out of the house, right? I found the perfect day-trip for those in the Austin area. The Flea Market in Kyle, Texas. I know, a flea market invokes thoughts of dark smoky places where the broken toys of your childhood gather dust next to an old VHS of Over The Top... and about 10 years ago when I visited the Flea Market in Kyle it was kind of true to that thought. But, in recent time, they've stepped up their game and there are some great booths with some amazing discoveries. It's also smoke-free inside. 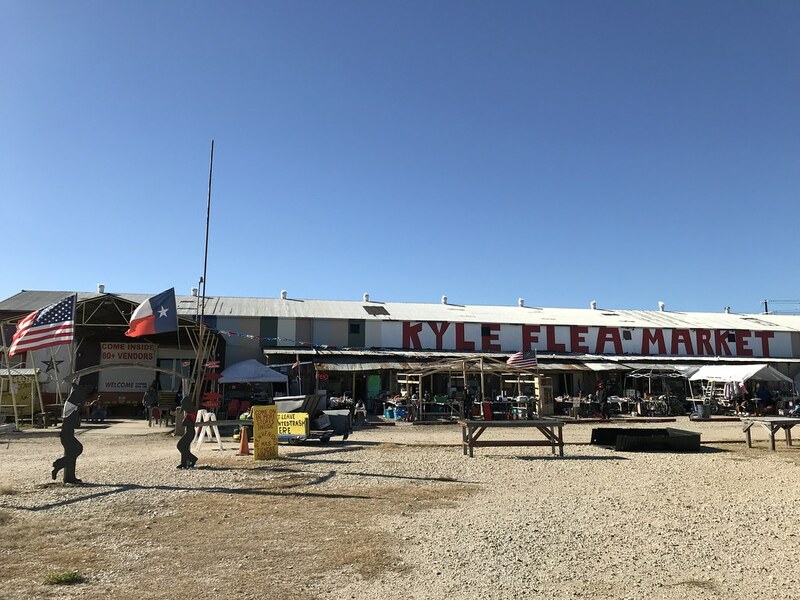 Kyle Flea Market (Web |Facebook) is located at 1119 N Old Hwy 81 in Kyle, Texas. It's just off IH-35 on the southbound access road. They are open from 9a - 5p on Saturdays and Sundays year round. Driving up that dirt road towards the big tin-roofed building that sports a huge "KYLE FLEA MARKET" on the top - I felt like I was going to an old-school swap meet. There were folks with tables on the grounds in front with piles of clothing and "sellable junk" akin to a big multi-family garage sale. I found out later that anyone can "buy" a space outside for a few bucks. I took my parking space (it's free) and decided to bypass those folks and walk into the building. Once inside, there are what seems like hundreds of "booths" that feel more like individual stores within the building. The layout is a large rectangle with two walkways... stores on either side. 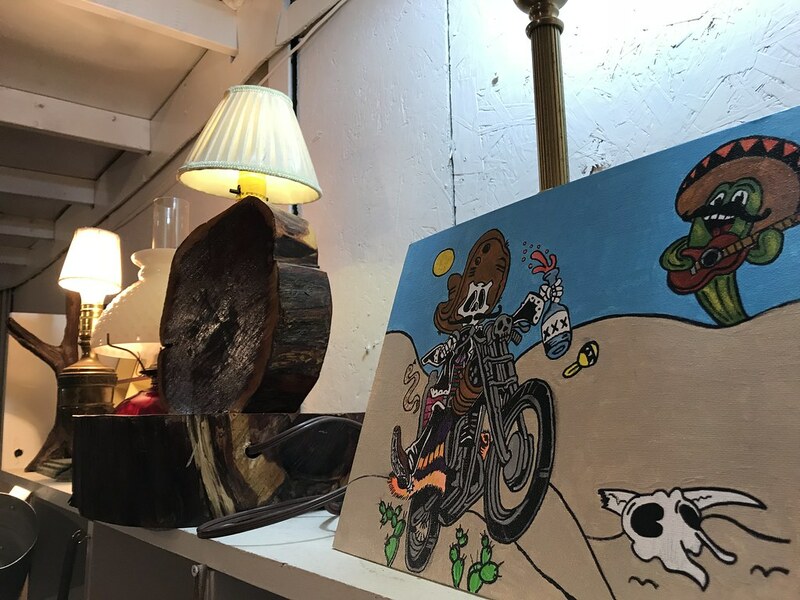 There's toy stores, an art space, stores with paintings, some refinished furniture spaces as well as some with "upcycled" furniture. There are some antique, knife/weapon, and feng shui spaces. Some hand-made knit items and some college-themed hats/shirts/collectibles. 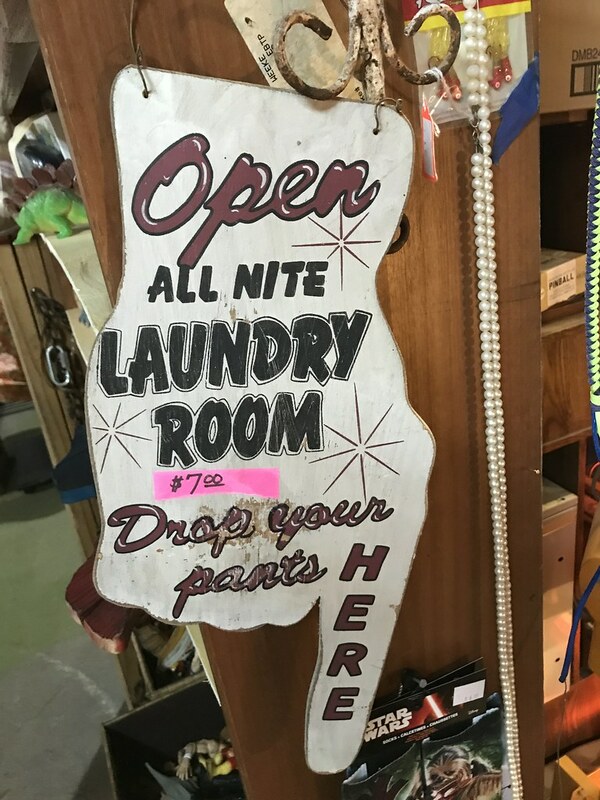 Yes, there are some "garage sale" flea market booths, but they are outnumbered by manicured "antique" stores. In other words, they've done a great job turning this place into a pretty nice and safe place that the entire family can visit and get some great deals. It's well lit and the booth owners (for the most part) are really nice and welcoming and ready to chat you up or sell you a new-to-you item. One of the stores I walked into took me back in time to college... in San Marcos, Texas. There was a Hastings there and this space had some of the signage from that location. Almost bought a huge newsstand sign for $10... but decided to leave it there for someone else to discover. I chatted with the owner and he uses this space as a sorting space for a consignment store he owns in San Marcos called Junk In Da Trunk. Because of this, it was one of the stores where you dig for treasures instead of find the wares displayed. Oh, There was also a cheeky laundry sign that made me chuckle. 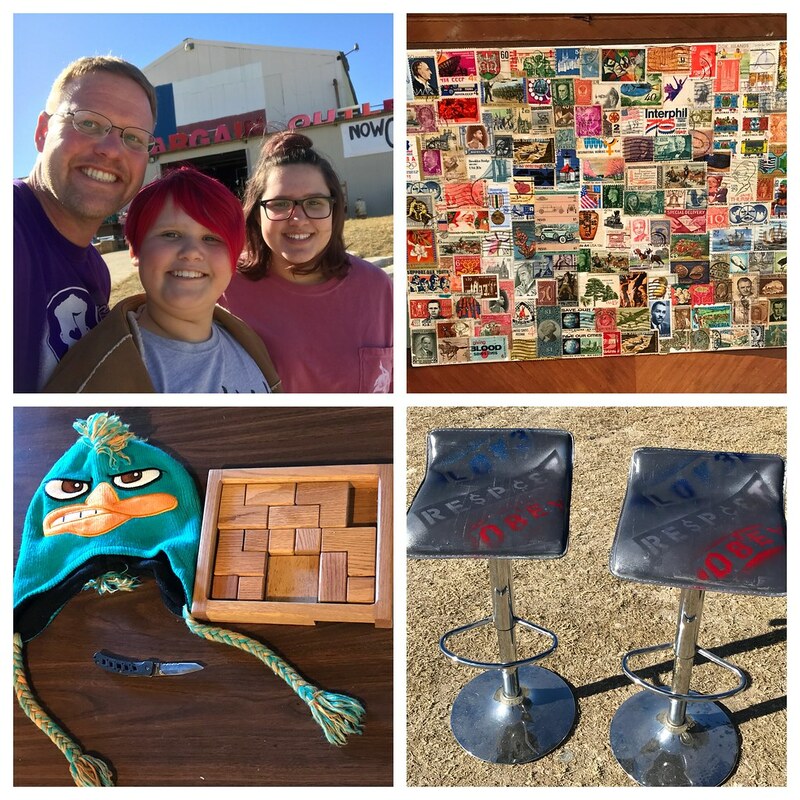 On the other side of the spectrum, there was a fantastic upcycled furniture store (Booth 70A) where I found some fantastic bar stools that were turned into functional art pieces. The owner, who holds this space as an overflow for a North Austin upcycle furniture gallery (where the prices are likely tripled) had them retailing for $30 for the pair. They now reside on my back porch... but what drew me into the space was a "mounted deer head" piece that was both beautiful and funky. In addition to the stores, there is a modern art space in the back corner of the space encased in glass. 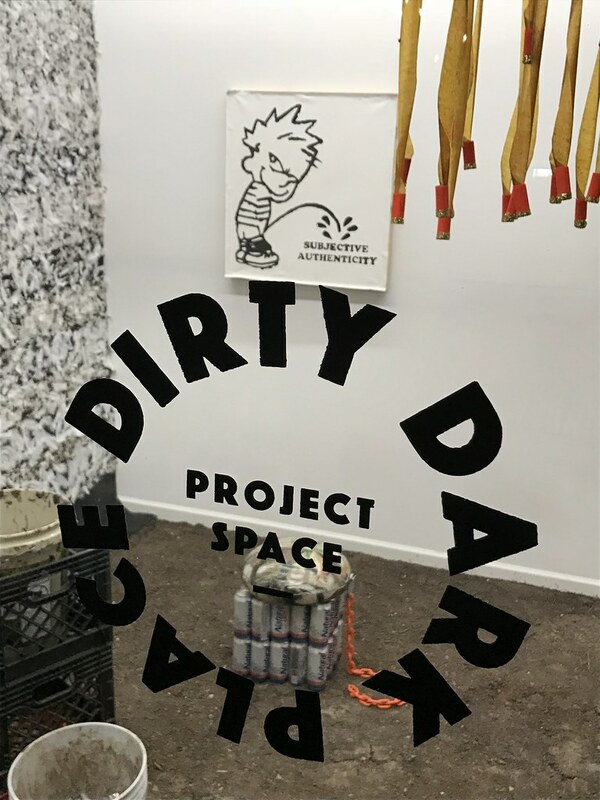 It's the Dirty Dark Place, an "errant, artist-run project space." The current installation, entitled "Bornagain" evokes a post-apocalyptic living space complete with makeshift seating, fly-paper chandelier and camouflage toilet paper. 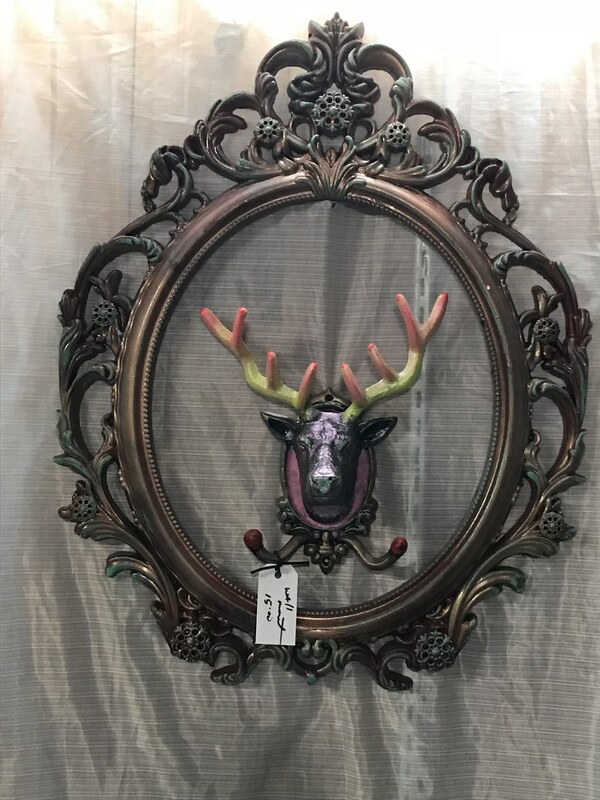 It's definitely a modern art piece that is open for interpretation and feels both awkward and right at home at the Kyle Flea Market. Once I got my modern art appreciation in, I walked into a store that reminded me of one I'd find in Chinatown Center in Austin. 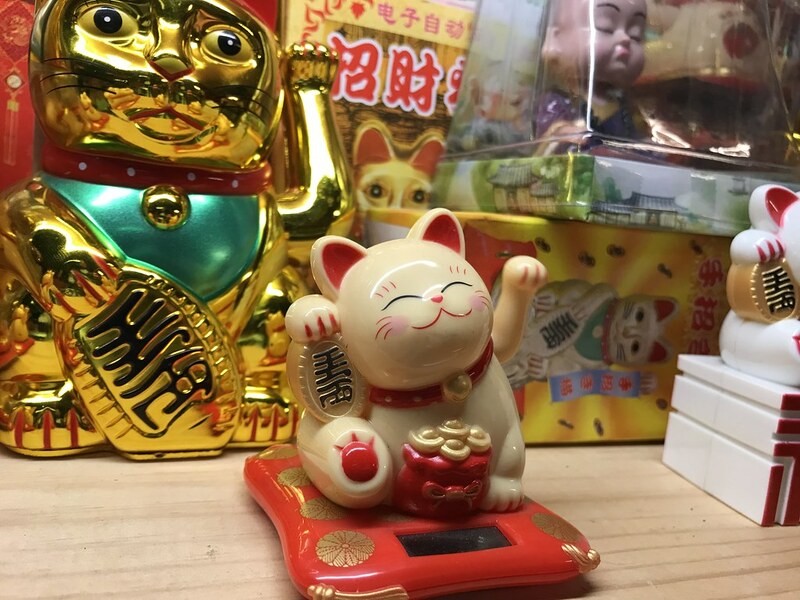 Gold and Green Jade has a large display of feng shui items and a great assortment of maneki-neko (often referred to as the "Chinese Lucky Cat"). The owner, Kim Lee, was really welcoming and gave me a nice tour of her space. 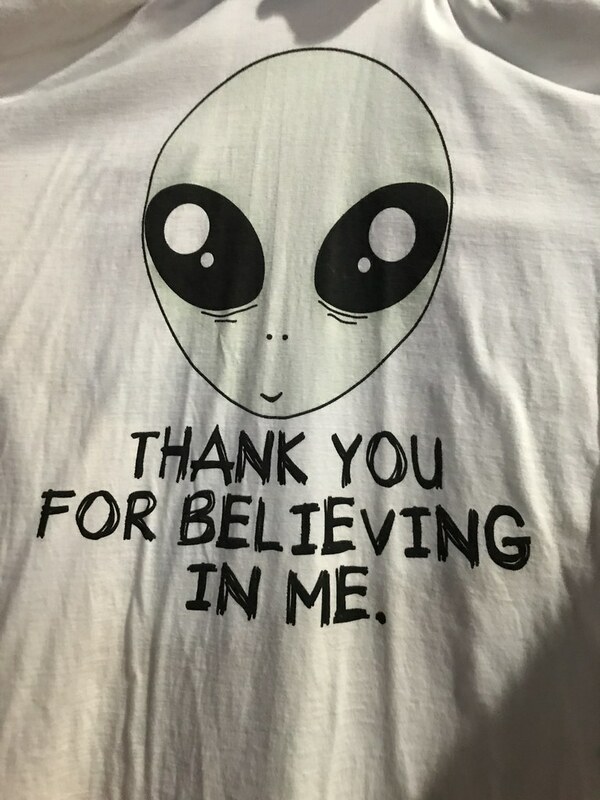 Of course, not trip to a space like this is complete without finding some funny, strange and just plain weird items. That is part of the fun of going to the flea market, isn't it? 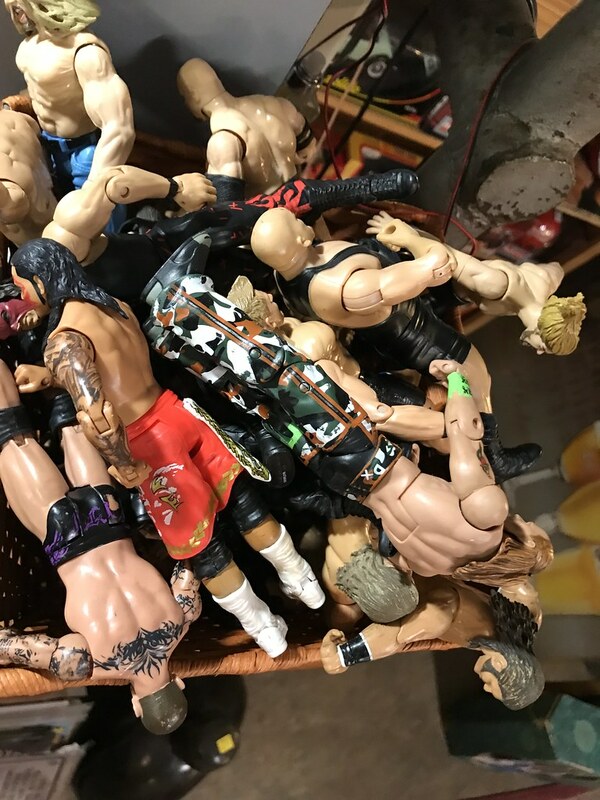 I found a few funny t-shirts, a box of wrestlers, a painting of a cactus playing the guitar and some other great items. 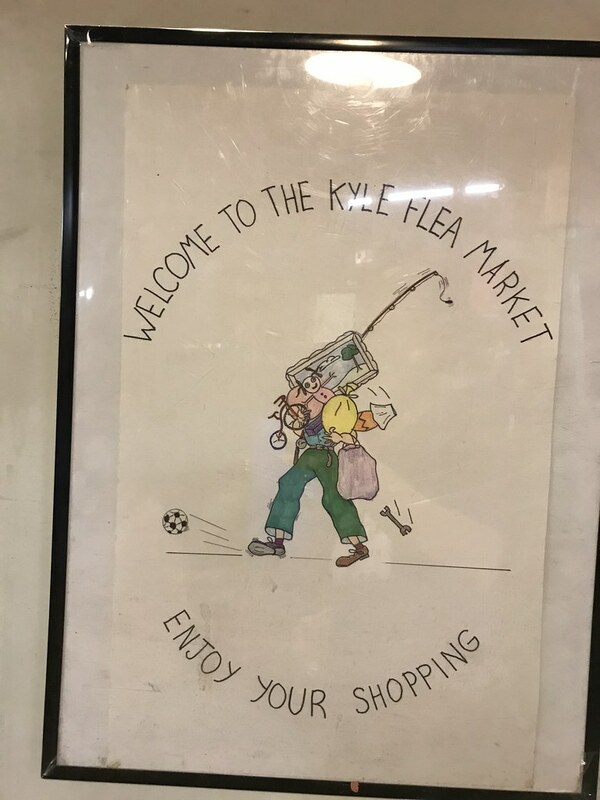 So, if you've got a few hours to kill and a few bucks in your pocket to spend, I'd highly recommend checking out Kyle Flea Market. You won't be disappointed. This is a fun game I like to play with my kids (10 and 13). Everyone has $5. Get the coolest/neatest/most interesting thing you can for that price. The great thing is... most of the booth owners will work with you on price (sidenote: This game is also great for helping the kids get comfortable talking with business owners and other adults). The author & his kiddos with the $5 finds game results.